Guild Wars 2: Heart of Thorns has been a bit of a tumultuous experience. Many players complained about a content drought, given that there was nothing new from its release in October of last year until July of this one. However, with the release of Episode 2 of Season 3’s Living World, the team seems poised to end that stigma once and for all. Dubbed “Rising Flames,” the episode focuses heavily on the aftermath of Mordremoth and the stirrings of the Elder Dragon Primordius. I had a chance to get a quick sneak peek into the new features to let you all know what you might expect. The first thing our group was treated to was running the new story instance. Basically a simulation program created by Taimi to combat the dragons and their ilk, it features waves of increasingly harder enemies. Since you’re training against Primordius, these creatures leave wide patches of flame on the ground when they’re dead, causing great damage to players who stand in them. Fear not, though, because periodically orbs will spawn that, when crossed through, douse all the flames in the area. These need to be used strategically so the room doesn’t end up covered in fire because you decided to put a single one out. Fans of Super Adventure Box might also get a bit of glee at certain points, too! These Karka are a lot nastier than the one's we've met before. There is also a great deal of lore explained in this short instance. Without spoiling anything, be prepared to learn everything that’s happening when a dragon is defeated. To say I was shocked by that particular revelation is an understatement. There are also some scenes that play out with Rytlock which also leave you more questions than answers. Well played, ArenaNet. From there, we traveled to the new area for Episode 2, Ember Bay. Fans of the original Guild Wars may recognize this area and what it may hint at in the future. This new zone also comes with a brand new mastery: lava tubes! Entering these tubes launches your character across the map to the connected tubes, and further still if those tubes are connected to other tubes. Luckily, you can activate your glider at any time during your, shall we say, explosive journey to get anywhere else you may be interested in. The island, as you can imagine, is populated by and in large by Primordius’s creatures, though there are also some errant karka to deal with who washed up on the shores. There are plenty of new hearts to work on here, and as explained, many are repeatable later on. One of the more amusing ones I saw was a reformed Skritt pirate and your aiding his crew in fighting off the menaces of the island (and perhaps helping some of them find treasure along the way). It looked to me as if there was plenty of exploration to be had on the map, so explorers will rejoice. There is also a brand new PvP map called the Eternal Coliseum. While I did not have a chance to engage in any matches here, it promises to offer a style of combat reminiscent of the actual Coliseum of Rome. 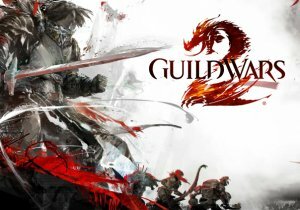 How this mode will play out to fans of the PvP in Guild Wars 2 will be seen in the coming weeks. It’s good to see ArenaNet pumping out content post Heart of Thorns, considering Episode 1 launched only two months ago. For me, the storyline revelations were the biggest draw, but the content itself seems solid as well. Hopefully they can keep this momentum going, especially given what Episode 2 brings to the table; a new instance and an entirely new zone is nothing to sneeze at, after all. Rising Flames sets the bar at height that it hopefully remains at for the remainder of the season. The Hearthstone team announced last week that some balance changes were coming, via an announcement on Twitter. The latest update to Legacy of Discord: Furious Wings offers the Metamorph System, which will allow players to become mysterious creatures. Winner of Facebook’s Best New Games of 2014’ award, IGN Top upcoming Iphone game, League of Angels is now available all over the world.